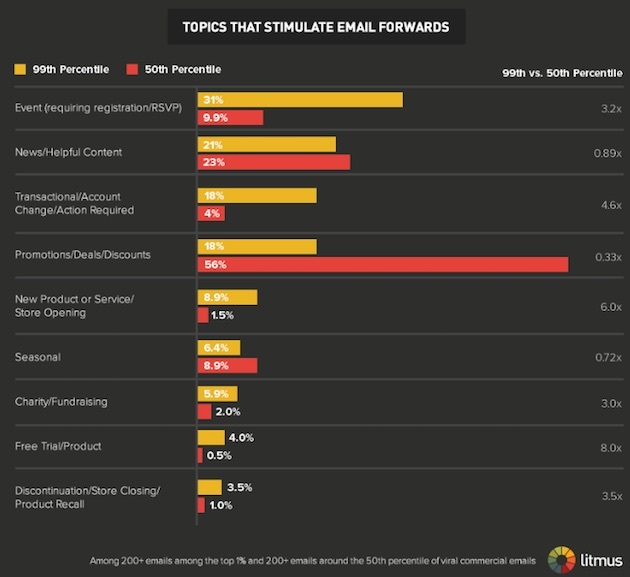 Which types of emails from brands are consumers most likely to forward? Are personalization, segmentation, audience size, and subject matter virality factors? To find out, Litmus examined the forwards generated by more than 400,000 commercial email campaigns with at least 500 opens sent between January 2013 and March 2015. 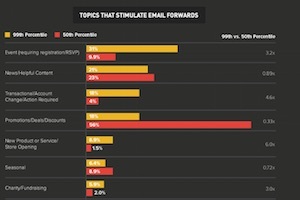 The researchers then compared 200 email campaigns from among the top 1% of forwarded emails with 200 email campaigns from around the 50th percentile to see how tactics, topics, and other elements impact sharing. 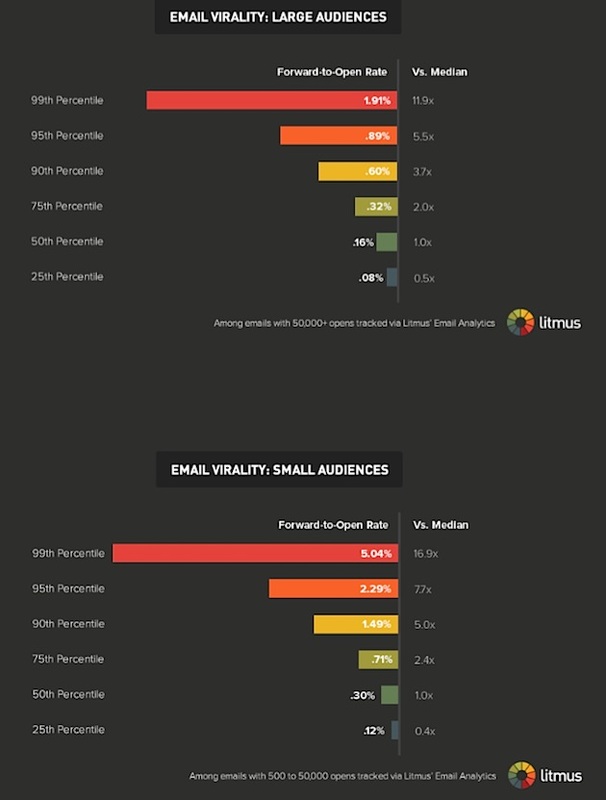 The median marketing email campaign (50th percentile) has a 0.27% forward-to-open rate, the analysis found. 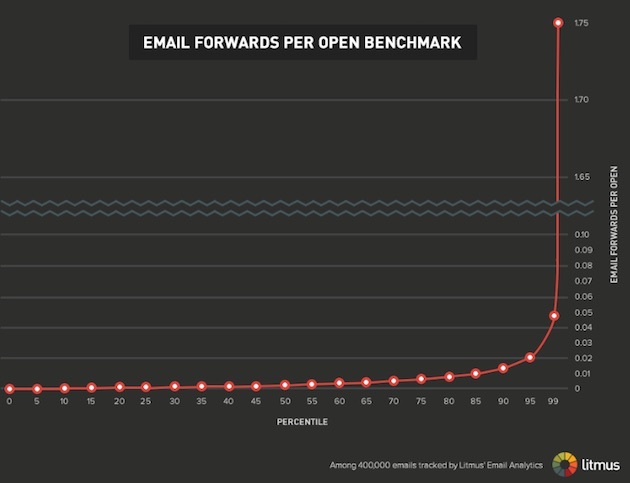 In other words, a middle-of- the-pack email generates 1 forward for every 370 opens. Forwarding increases exponentially from there; campaigns in the 75th percentile are 2.4x more viral compared with the 50th percentile, and campaigns in the 99th percentile are 17.6x more viral compared with the 50th percentile (i.e., the top 1% most viral emails generate 1 forward for every 21 opens). Emails in the 99th percentile are 13 times more likely to include a “share with your network” call-to-action compared with emails in the 50th percentile (6.4% vs. 0.5%). The top 1% most forwarded marketing emails are also much more likely to be segmented or triggered; 13% of campaigns in this group are segmented and 16% are triggered, compared with only 3% segmented and 5% triggered in the 50th percentile. Personalization also seems to impact virality, with 9% of emails in the top percentile containing personalized content compared with only 2% of the baseline emails in the 50th percentile. Audience size is strongly correlated to forwarding rates, with campaigns sent to smaller, more niche, groups being much more likely to go viral; the median campaign with 500 to 50,000 opens was forwarded 90% more compared with the median email with 50,000+ opens. Marketing campaigns about events, especially those that require a registration or an RSVP, are more likely to be forwarded compared with other topics. Emails that are transactional, involve account changes, or require action are also more likely to be forwarded. About the research: The report was based on data from more than 400,000 commercial email campaigns with at least 500 opens sent between January 2013 and March 2015.